Welcome to Democrats Abroad Stuttgart! DA Stuttgart is a chapter of DA Germany, the official country committee for US Democrats living in Germany. Our chapter includes members all over Baden-Württemberg with precincts in Freiburg and Tübingen. If you’re in the area and looking to connect with welcoming, dedicated, and democratically-minded people, then you’ve come to the right place. On this page, you’ll find information about upcoming announcements of meetings and events throughout the year. We encourage anyone interested in participating to get in touch. If you have questions or would like to help with Democrats Abroad in Stuttgart, please contact us. We look forward to meeting you! I’m running for Stuttgart Chapter Chair because I’m invested in this community and committed to doing the necessary work to ensure it grows, evolves, and thrives. 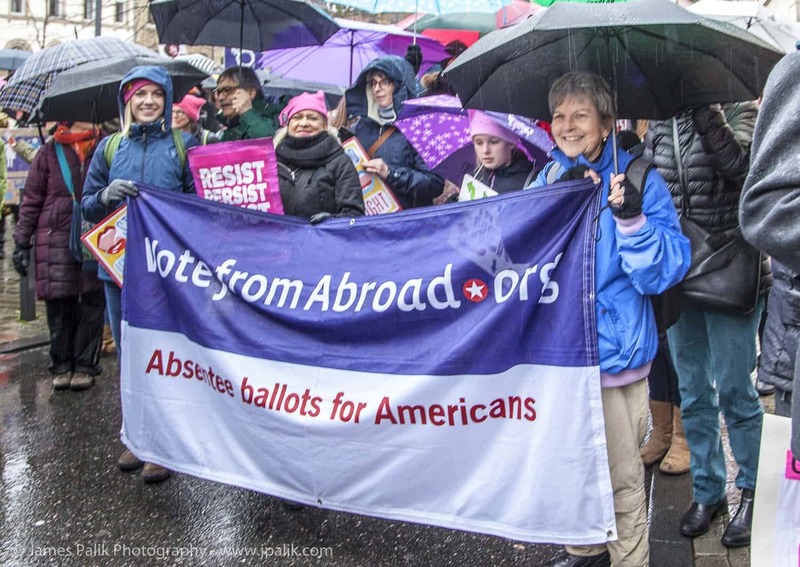 While one of the primary focuses of Democrats Abroad is to register overseas voters, I see our mission as extending beyond that. DA provides the opportunity for Americans abroad both to speak with like-minded people and to broaden our world perspectives. We are, in many ways, unofficial American foreign ambassadors, and I hope to lead the Stuttgart chapter in increased engagement in cultural exchange experiences in our host country. As a DA member, I’ve organized and led events, written new role descriptions and petitions, worked on DNC reform campaigns, and currently, I’m a leading organizer of the DA Global Women’s Caucus international book club called Books Abroad. As an active member of the Women’s and Progressive Caucuses, my experiences at the caucus level will inform my leadership as Stuttgart Chair as I work to diversify the voices within our chapter to welcome and encourage input from members, new and existing. I intend to make general meetings more accessible—perhaps on an online platform like WebEx—and introduce more social events such as movie nights, pub trivia, picnics in the park, etc. Based on feedback from my fellow members, I hope to foster the right balance between activism with an agenda and building a fun social community. We are looking forward to a Happy Blue Year! The November 6th election wasn’t just a blue wave. It was a blue Tsunami! As the final statistics are coming in, they confirm that Democrats crushed Republicans with the largest Democratic House gain since 1974! And we made a difference right here in Germany! Many races came down to just a hand-full of votes, and our overseas ballots were the margin of victory! Thanks to all of you who voted in the most diverse and dynamic congress we’ve ever seen! 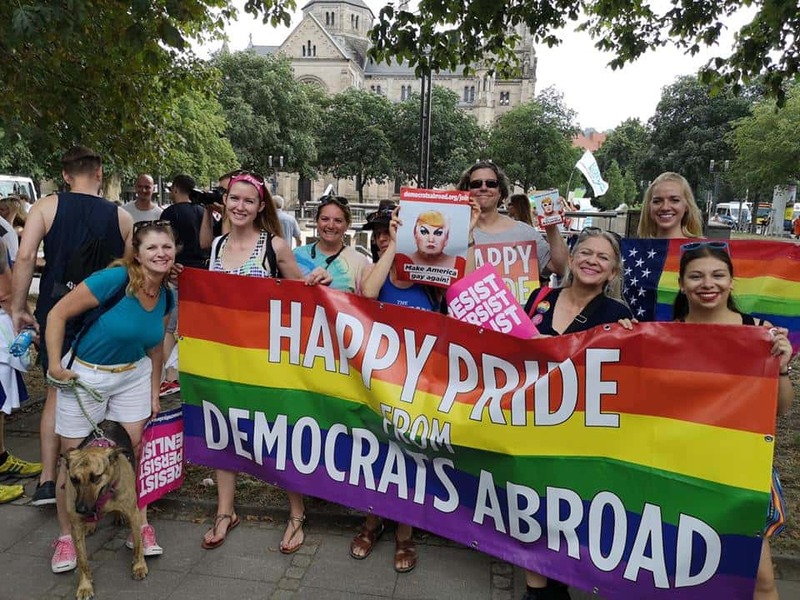 We have the momentum, and our own Democrats Abroad Stuttgart chapter is gearing up right now to keep pushing our agenda all the way to the 2020 presidential election. We will be holding Chapter Chair Elections on the 11th of January at our regular monthly meeting. All current members of our Democrats Abroad Stuttgart Chapter are welcome to come and vote in person. If you are interested in running, please reply to this email by January 1st stating your intention to run. You are encouraged to include a short statement of less than 250 words supporting your candidacy, to be published to the body on our website. If you decide to run after the first of January, you may be nominated during our meeting, but you will need someone else to second your nomination. Full election rules can be found here. If you have questions, contact Ann at DAG-Stuttgart@democratsabroad.org. Have you filled out our Voter Protection Survey? Please take a minute now to let us know about your voting experience and encourage other Americans abroad to do the same by completing our very short Voter Protection Survey. Come for “Margarita Mittwoch” and stay for some good, quality conversation! Ring in the new year with fellow Americans in the Freiburg area, grab a drink together, and talk about all things politics! We also want to share news about upcoming DA events and hear your ideas for what other events Freiburg-Americans might like to participate in. Please note that because of the holidays, we are meeting on the second Wednesday of the month, instead of our usual first Wednesday. We’ve come a long way this year and women are more empowered than ever before. But we’re not done yet! We will keep marching to stop violence against women and secure our equality under the law. Just as we did last year, we will meet at the Stuttgart Main Train Station and travel as a group to Heidelberg. The march in Heidelberg is expected to begin at 13:30. We will be sharing our travel details on our Stuttgart Chapter website and our Facebook page so stay tuned! Every year Democrats Abroad Germany gathers in person to discuss issues and plan our activities for the coming year. In addition to these discussions, we will also be electing our new Executive Committee (ExCom) in 2019. This event open to ALL MEMBERS! If you are curious about what we do, interested in becoming more involved, want to participate in a training, or just looking to some fun, then travel with us to Heidelberg! CALLING ALL VOLUNTEERS- Wherever you are! Democrats Abroad is an all-volunteer organization. There are many jobs, large and small that need to be done to help our chapter thrive. Many of them can be done remotely and don't even take much time. Help distribute our brochures at places where Americans hang out. Hold a mini "activist meeting" in your own home or the neighborhood pub. If you would like to volunteer or would like more information, please contact DAG-Stuttgart@democratsabroad.org or update your DA profile at democratsabroad.org and be sure to check off "interested in volunteering" so that we can follow up. If you have other skills, other ideas, and other ways you think you can help, please get in touch with our new chair. It has been an honor to serve you all as chapter chair in these past years, and I look forward to continuing to work within our Stuttgart chapter and also as a DA global leader to make the political and social change we want in the world. We were all inspired last week by the brave and unforgettable testimony of Dr. Christine Blasey Ford. She has given us all courage and has strengthened our resolve to push even harder in these last weeks before the election. We can best honor her courage and sense of civic responsibility by voting in this crucial election, and by encouraging our friends to vote too! If you know anyone who still needs to register to vote, please send them off to votefromabroad.org today. If you have family or friends in the U.S. that still need to register to vote, send them to https://iwillvote.com/. Help us with one last Task! There is still one last important task that we’re working on ‘round the clock and ‘round the globe now, and we could really use your help. Over the next two weeks we are reaching out to our fellow members in a phonebanking effort to remind them to register and send in their ballots. Click here for more information on how you can help us! Checking the Balance - Democracy, at what cost? Wednesday, October 17th at 7:00 p.m.
Our DA Stuttgart chapter will be at DAZ for a discussion as part of their very popular “American Days” event. · What policies and initiatives have emerged in this topsy-turvy election cycle? · How far does free speech extend? · How can we provide protections for our environment and assure safety in our lives? · Are our fundamental civil rights being chipped away? · How can we respond to these challenges and restore political equilibrium? Join us to share your views! Please join us on Tuesday October 16 at 2PM EDT for the kickoff meeting for the Global Women’s Caucus Equal Rights Amendment (ERA) project. Kamala Lopez, the executive director of Equal Means Equal will be sharing information about the history and the current status of the ERA along with what needs to be done. 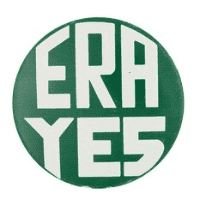 For more background on the ERA, check out our ERA Resources here. 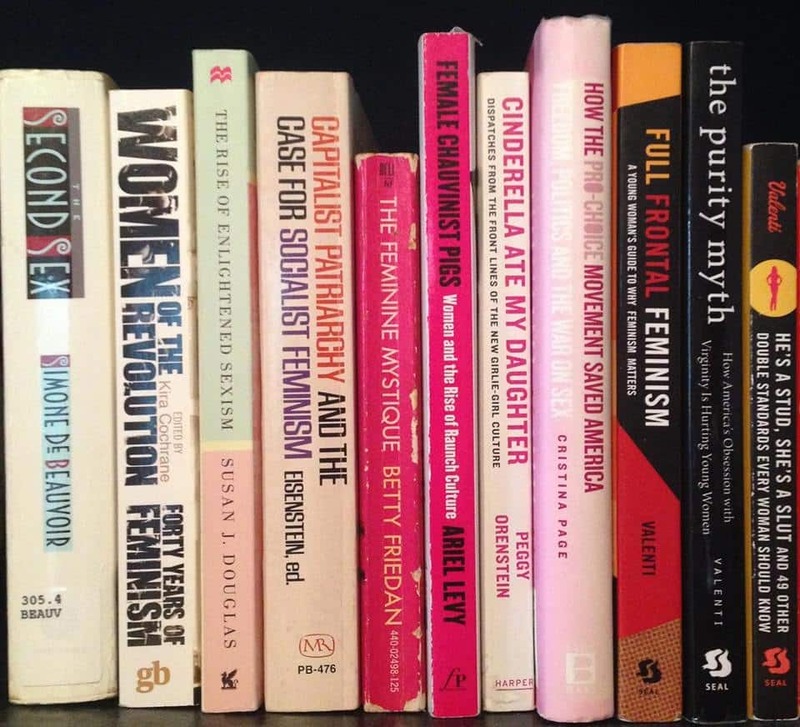 Join our global feminist reading group, conducted on Webex with you right in front of your own computer screen! At this meeting, we'll be discussing Rebecca's Solnit's book The Mother of All Questions, a collection of essays centered around feminist storytelling. Solnit, a California native and lifelong activist, is credited with inspiring the term "mansplaining" in a 2008 essay titled, "Men Explain Things to Me," which later became a book published in 2014. The Mother of All Questions is a follow-up to that book in which Solnit further unpacks cultural misogyny and the power of a woman's story. It has been a rough ride since November of 2016. And we are cautiously optimistic that this meeting will be a joyous one! But come what may, we will need to be together. To celebrate, to plan, to strategize, to discuss. This is a meeting you won’t want to miss! Watch for additional events each month, or changes which don't always make it into our newsletter by checking our Stuttgart Chapter website and Facebook page for the latest updates on events! 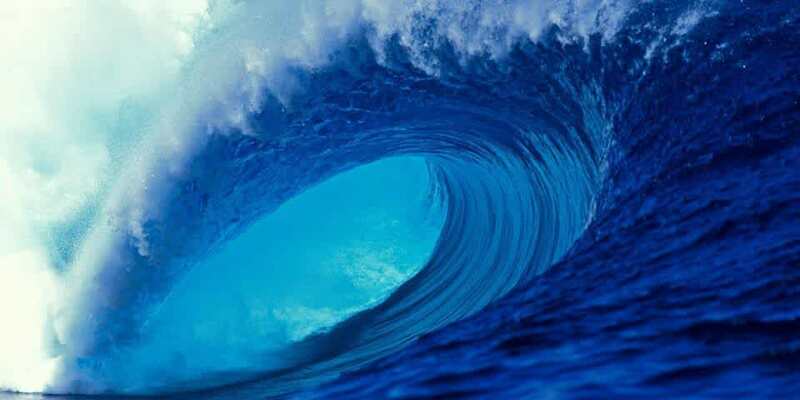 Remember that it will take ALL OF US returning those ballots in the coming weeks to really power that big blue wave we’re hoping for. I look forward to seeing you at one of our events. 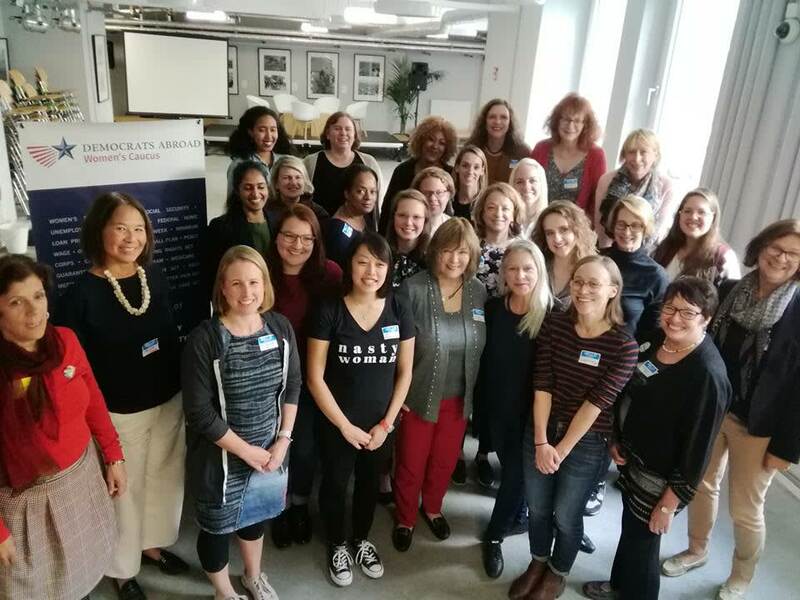 On Saturday, the 22nd of September, Democrats Abroad Women’s Caucus members from eight of the twelve Germany chapters met for a day-long workshop in Berlin. The workshop was divided into five sessions, each one focusing on a different approach to language and messaging. Together, the 33 participants unpacked words and phrases like “pro-choice,” “emotional,” and “misconduct,” before moving on to discuss the ways in which women are under attack and what we as Democrats need to focus on as we push forward. One participant succinctly summarized the conversation in three main points: 1) the need to create safe spaces for women and allies to hold dialogues, 2) deciding on effective political strategy, and 3) answering the question, “What do we stand for?”. As a group, participants recognized that Donald Trump and his administration are merely a symptom of systemic racism and misogyny. To combat the insidious cultural forces that Trump represents, Democrats must not only resist the destruction wrought by his administration, but also—and more importantly—push forward with progressive action. Participants agreed that in order to move forward successfully, we must elect more women representatives, support better voter education, and define our goals as Democrats in a clear, positive way. Thanks to a presentation on “women to watch,” participants were energized with a long list of trailblazing women running for office this November, and it ended with speculation on female presidential candidates for the 2020 election including Elizabeth Warren, Kamala Harris, and Kirsten Gillibrand. Currently, women comprise only 20% of Congress, and while women turn out to vote in much higher rates than men, the Center for American Women in Politics reports than only 63% of eligible women voters cast ballots in the 2016 federal election. Hopefully, women and members of other marginalized groups claiming a more proportional chunk of elected offices will encourage eligible voters of all genders to head to the polls. The final two sessions of the day asked participants to rethink commonly used phrases like “equal pay for equal work,” “the right to choose,” and “#MeToo” in order to rebrand our messaging. As one speaker pointed out, Republicans do a better job of marketing their messages to make emotional appeals while Democrats tend to over-rationalize. The last presentation of the day challenged participants to consider reframing our political dialogue. Democrats have fallen into the habit of allowing Republican leaders to define the discourse, creating our terminology in response to theirs rather than establishing our own, and then building a platform in opposition to Republican efforts rather than in the pursuit of Democratic ideals. In other words, we were reminded that we need to stand for something not just against something. After a day of re-examining and celebrating the cross-sectional connections that unite us as women, Democrats, and Americans, we continued our atmosphere of kinship with a big, family-style meal at a local Indian restaurant. Refueled and refocused, our minds are looking forward. Thanks to all of you who turned out for the Political Pride Parade in Stuttgart last month. We made face-to-face contact with hundreds of people, had a blast, and really raised our profile. Thanks also to all our fabulous, hard-working volunteers scattered throughout Baden-Würtemberg. We are so lucky to have precinct captains, caucus leaders, event organizers, phonebanking champions, and so many others working on the frontlines and behind the scenes. We applaud your activism and your spirit! As activists, we know how crucial the November 6th Mid-term election is. Every glance at the news brings new outrage and feelings of despair. We also know that the best way to combat that helpless feeling is to do something to fight back. That’s why we volunteer! But you don’t have to lead the whole parade to be an activist! Each of us can do our small part and we can start right now. Today! We can reach out to each other! Democrats Abroad Germany is making an extra push right now to have our members personally reach out to fellow members and remind them to register to vote. Some of our wonderful Stuttgart chapter volunteers have already made dozens of calls! 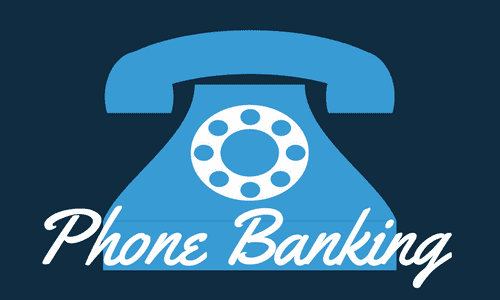 You too can join our phonebanking initiative! DA uses an online system that lets you make no-cost calls from your computer. There is even an on-screen script for you to use. Please click here for a step-by-step guide on how to get started. Please do give it a try and help to power the blue wave that will transform Washington in November! Activism starts with your own vote! If you still need to register, go to Votefromabroad.org today! If you are already registered, it doesn't hurt to check your registration at https://iwillvote.com/. This election is extremely important. Don’t miss it! Friday, September 7th at 7:00 p.m.
Help us celebrate the first-ever worldwide Democrats Abroad Day! Our meeting will be dedicated to YOU, our members! We have marched and stood vigil together, call-stormed, phonebanked, registered voters, and participated in hundreds of virtual and in-person events. Let’s pause for a moment to show our pride, connect with each other, re-affirm what we stand for, pat ourselves on the back and have a little fun before we enter the election homestretch. Wear all your DA gear, T-shirts and Buttons! Do you still have your favorite march signs? Bring them! We will be taking lots of pics to post the next day for the official “Global Virtual Democrats Abroad Day Party” on September 8th! And we’d especially love to see some new faces! All curious Americans are welcome. Just stop by, have a drink, and get to know us. Come for Margarita Mittwoch and stay for some good, quality conversation. This is your chance to meet other Americans in the Freiburg area, grab a drink together, and talk about all things politics! We also want to share news about upcoming DA events and hear your ideas for what other events Freiburg-Americans would like to participate in. Stuttgart Women’s Caucus goes to Berlin! Join us in Berlin for an all-day workshop that will help to re-focus, re-vitalize and re-empower us all for the fight ahead! The Women’s Caucus is for everyone who cares about equality. We want to see men and women working together at this event! Watch for additional events each month, or changes which don't always make it into our newsletter by checking here on our Stuttgart Chapter website and Facebook page for the latest updates on events! In a crowded room at the Literaturhaus in Stuttgart, members of our Democrats Abroad Women’s Caucus gathered with about 180 people to listen to Rebecca Solnit perform readings of her newest book, a collection of essays titled, The Mother of All Questions, and answer questions about literature, activism, and the future of American politics. Solnit’s book begins by challenging the notion that a woman’s capacity is limited solely to childbearing rather than creations of the mind. Recalling a talk she gave on Virginia Woolf, Solnit described how the line of questioning quickly turned to reasons for why Woolf didn’t procreate instead of focusing on what she did create—her exceptional written work. In fact, one of the things Woolf famously wrote about was dismantling expectations for women to be the “Angel in the House.” Nearly 90 years later, women continue fighting against this ideal, and Solnit’s book argues that we must refuse questions that attempt to define what it means to be a woman. Instead, Solnit says, we must reject simple answers and embrace the unknown. When reflecting on the literary canon, Solnit remarked that a book without a single woman in it is about humanity, but a book with a woman protagonist is a “woman’s book.” Knowing that we learn to imagine the world from the literature we read, it’s no wonder that straight, white men in particular often cannot imagine themselves as anyone else—they’ve never had to do so. In this way, diverse stories have never been more important because they provide us with different lenses through which to view the world and invite questions about whose stories are being told. Thanks to literary giants of the past like Woolf, James Baldwin, Gabriel Garcia-Marquez, and so many others, we’ve seen an explosion of diverse literature in the past few decades that asks all readers to listen and reimagine the world. In conjunction with examining whose stories are told, Solnit’s book also prompts readers to consider silence—specifically, who has been silenced historically and currently. Perhaps the loudest breaking of that silence recently has been the #MeToo movement. While it seems like #MeToo was a sudden wave of unleashed stories, unprecedented support for those stories, and demands of accountability, Solnit reminds us that #MeToo was a culmination of previous, long-term efforts of women (often women of color) speaking out. As demonstrated in the #MeToo movement, stories grant the previously silenced the ability to be heard and grant everyone else opportunities to broaden their perspectives. Placing these notions of silence, stories, and listening in context with the larger political climate, Solnit urged the audience to remember that elections are the bedrock of democracy but daily actions are what preserve it. If we are to recover from the Trump presidency, it is imperative that we read about the past, listen to each other’s stories, and, as Rep. John Lewis has said, make “good trouble, necessary trouble.” November is still far off, and we must work every day to defend our basic rights and democratic values. 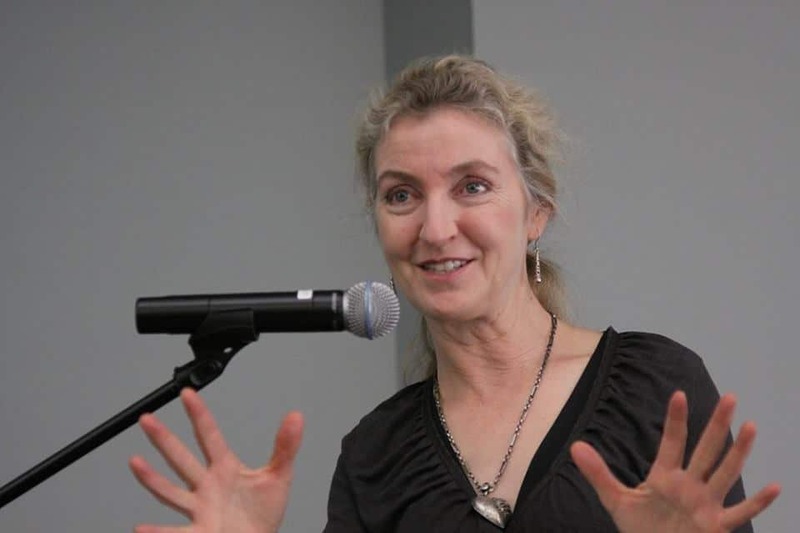 Referencing an article in The Guardian, Solnit stated that historical studies suggest it only takes 3.5% of a country’s population (about 11 million people in the U.S.) to topple an unpopular regime through sustained nonviolent opposition. Solnit announced that an upcoming campaign to impeach Trump will be starting soon. The Women’s Caucus international book club, Books Abroad, will discuss The Mother of All Questions at our next meeting on Sunday, October 21. Please join in! The weather was warm, the mood was celebratory as hundreds gathered in the middle of Stuttgart to stand up for Science and listen to distinguished scientists from our region’s many Universities discuss the future of research. Speakers included rectors from both of Stuttgart’s Universities, as well as representatives from Karlsruhe Tech, and Heidelberg. 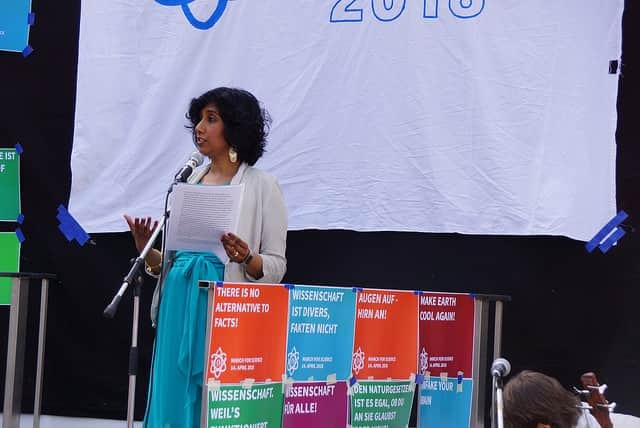 Dr. Radhika Puttagunta, American scientist and Democrats Abroad Stuttgart chapter member, was there to share her perspective, and even gave a shout out to our valiant DA voter registration team, pointing out how important it is to vote in defense of science! Dr Puttagunta is the group leader in experimental paraplegiology and Neuroregeneration at the University of Heidelberg Clinic. “Standing here in Stuttgart, the city known for the invention of the automobile, we do not need to sell you on innovation or science. Germany leads the world in recycling and renewable energy because you take climate change seriously and want to preserve the environment. Here in Germany, I have worked at the University of Tuebingen where Noble prize winning developmental biologist Prof. Dr. Christiane Nüsslein-Volhard can be found alongside the location of the first isolation of DNA by Johann Friedrich Miescher in the castle laboratory. I now work at Germany’s oldest and most renowned university, the University of Heidelberg, where I believe that Germans understand the benefits of science and innovation, however we are not here only to support that claim but to also see where we can do better. You may ask why did I myself decide to become a scientist. I can tell you for certain it was most definitely not for money or fame. I am a scientist because I am curious and want to know how the world works around me, how the human body functions, what happens when it no longer functions as intended and how I can address those problems and add to our knowledge base. Classically trained as a geneticist I now work on understanding how to get nerves to grow again after damage from a spinal cord injury. Not an easy task but incredibly fascinating. Such intense curiosity as my own is common in our young children. Think of that baby that keeps dropping things on the floor and wondering why it falls, rediscovering gravity over and over again, especially later on with their own bodies. Or at a playground, children discovering centripetal forces differ from the center of the merry-go-round to the outer edge where more force is needed to keep you from falling off. Or the enthusiasm of kids involved in planting seeds and realizing what it takes for that seed to germinate and grow. Children are just born curious, it is how they explore their world, and some cultures are better at cultivating this curiosity and turning out amazing scientists. Both my home, the United States, and my adopted home, Germany, do a wonderful job with young children, letting them be little explorers and scientists. However, as the amount of knowledge and information we have access to grows over time we seem to move away from learning how and why things work and move further toward extensive testing on this newly acquired information. By doing so the schools are pulling us away from pursuing that curiosity we are naturally born with. By the time I see students at the University the only question I get asked is usually if this is on the exam or part of their grade. We cannot raise the next generation of scientists if we do not instill in them this desire to know more, to discover, to question, to tinker, to build, to fail and to succeed. We need to let that curiosity spread through our schools, train our teachers to foster this desire and stop overloading with excessive testing. We as parents at home need to encourage our kids to dream big, be creative and imaginative, build, question and read everything they can get their hands on to answer those questions of why and how thus stimulating new ideas. At the University level, we as lecturers need to push our students to think, to question, to solve, to further our understanding, not to just recite and pass exams. Innovation comes from pushing yourself outside your comfort zone, questioning our understanding or limits of knowledge and discovering the unknown. The key here is that culture and society is often driving discovery through their desires of how to educate the next generation. This means that you have a greater influence on science than you probably imagined. This also rings true for the type of science that is found to be worth funding. Your voice matters when you vote, you influence the future. For my fellow Americans out there, I urge you to go the booth we have set up here and register to vote this year. Your voice not only impacts the US, it has an impact on the world and there is no greater time than now to have your voice heard. If we speak on a global scale, the current world population is made up of 50% women, however many scientific fields remain dominated by males. There is nothing wrong with that, but what is to say that is the best we can do? We are ignoring the input from half of our population! How do we know that together we would not do better? In fact we already know that diversity in science is essential, studies from various fields show that diverse groups are consistently more successful than groups of the “best” people who are virtually identical. There is no single test to find who is the best for problem solving but we do know that we work better in groups and science is not an independent sport, it is most definitely done best collaboratively. Published studies that have more collaborators tend to be more cited by other scientists, indicating they are of more value to the field. So if we want success in science and we want to push discovery and innovation forward than we must embrace diversity. It is not a matter of who is better but that when we put our collective heads together we are stronger than any one group alone. Here I am referring to diversity not only of gender but also ethnicity, sexual identity and orientation, immigration and family status. Each person’s experiences make up not only their life story but their unique intellectual and working perspective. Be this from experiencing motherhood, being an immigrant or dealing with homophobia. Once upon a time the US understood this and took in so many scientists from all walks of life from all over the world and those scientists went on to become the Noble prize-winning immigrants such as Einstein, Werner von Braun and Günter Blobel (signal peptides). Nearly 40% of Noble prizes awarded to the US are to immigrants. Why is that? Not only does the US encourage independence and creativity but by encouraging immigration they have let different perspectives and approaches come in to solve and innovate. So they have an environment that encourages the formation of diverse groups and these groups go on to do amazing things. Germany once lead the scientific world 150 to 100 years ago, until unfortunately they limited diversity but today Germany is embracing its role as a world leader and understands a diverse nation is a better nation, economically, scientifically and socially. Today’s choices will reflect in what Germany produces scientifically in the coming decades. I can say from personal experience at work where I am surrounded by people trained in fields very different from my own and with personal backgrounds equally different from mine that I am a better scientist because of a diverse environment and those around me also benefit from my unique perspective. “ R.P. Stuttgart marched for women’s rights! Despite pouring rain and icy cold, a group of roughly 30 hearty DA Stuttgart members, together with our precinct members from Freiburg and Tübingen joined a crowd of 500 activists to march in Heidelberg for women’s rights. We were welcomed by DA Heidelberg chair Nancy Schimkat who was on hand with her team to help any and all Americans with their voter registration. I was pleased to be able to share a few remarks at the end of the march highlighting some of this year’s successes for women. It wasn’t all bad news this year! Soaking wet, freezing cold and exhausted by the end of the day, we “nevertheless” could not help but feel a bit proud of ourselves to have been in the company of such amazing, dedicated and ”persistent” activists! Let us all resolve to keep on marching to the ballot box! If you haven’t done it already, now is a great time to request your absentee ballot for the mid-terms. Remember, Americans living abroad do have to re-register every year! Our own Democrats Abroad Stuttgart chapter is doing everything in our power to reach out to fellow Americans in our area, and help them claim their right to vote at home. Our primary project for this year is getting out the vote. We work hard, but we really do have fun! And we need your help!